Meeting of the Archaeological Institute at Lincoln. More Info Antique woodcut engravings which were published in "The Illustrated London News" on August 5th, 1848. Vertical centrefold as published. Views include 'The Conduit, Lincoln', 'Old Hall, Gainsborough', 'Hall of St Mary's Guild', 'Woolaton', 'Roman Conduit', 'Tattersall Ca\stle and Church', and 'Newark Castle'. 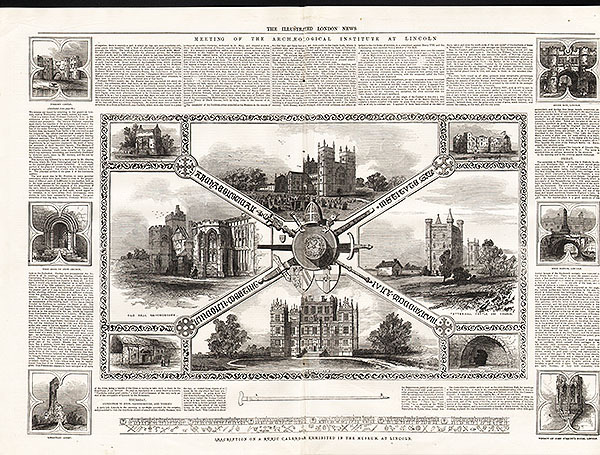 Antique woodcut engravings which were published in "The Illustrated London News" on August 5th, 1848. Vertical centrefold as published. Views include 'The Conduit, Lincoln', 'Old Hall, Gainsborough', 'Hall of St Mary's Guild', 'Woolaton', 'Roman Conduit', 'Tattersall Ca\stle and Church', and 'Newark Castle'. Lincoln, from the River Witham. An antique line engraving by S.T. Davies after T. Allom. Circa 1830 with later hand colouring. The High Bridge over the Wytham, Lincoln. An antique line engraving by J. Tingle after T. Allom. Published in 1836 with later hand colouring. An antique line engraving by F.J. Havell after T. Allom. Published in 1836 with later hand colouring. An antique line engraving by F.J. Havell after T. Allom. Circa 1835 with later hand colouring. An antique line engraving by J. Rogers after T. Allen. Published by John Saunders, Bond Street, 1830. Later coloured by hand. An antique line engraving by W. Watkins after J.N. Rhodes. Published by J. Saunders Jnr. in 1833. Later coloured by hand. An antique line engraving by J. Rogers after W.H. Bartlett. Published by John Saunders in June, 1834. Later coloured by hand. An antique line engraving by J. Rogers after J. Salmon. Published by John Saunders Junr. in 1834. Later coloured by hand. An antique line engraving by W. Taylor after T. Allom. Published by John Saunders in 1830. Later coloured by hand. An antique line engraving by W. Watkins after B.G. Topham. Circa 1830. Later coloured by hand. South East view of the ity of Lincoln. 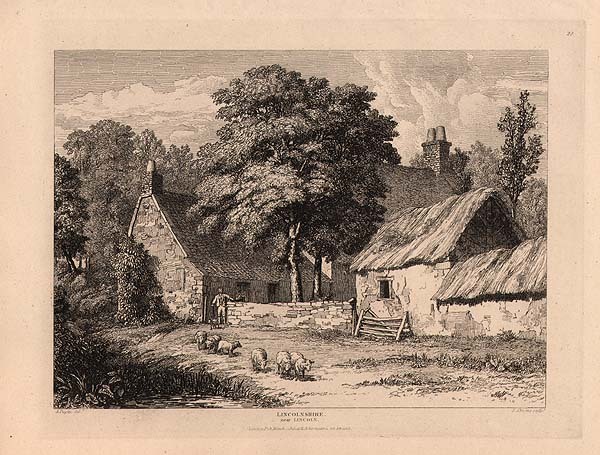 An antique engraving by W. Tombleson after G.F. Robson. Published April 1st, 1827 by J. Britton, Burton Street. S. W. view of the City of Lincoln. 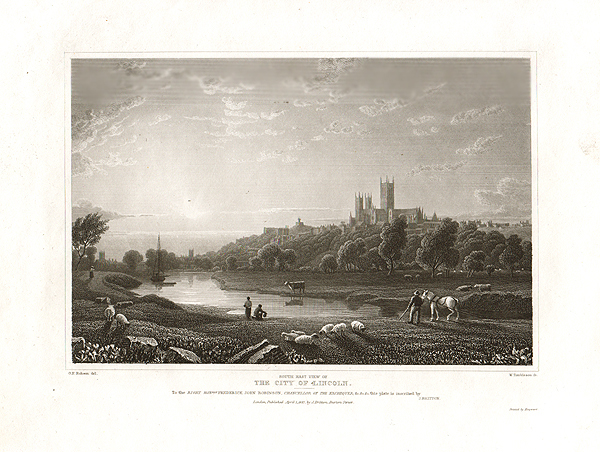 An antique engraving by H. Adlard after G.F. Robson. Published July 1st, 1827 by J. Britton, Burton Street. 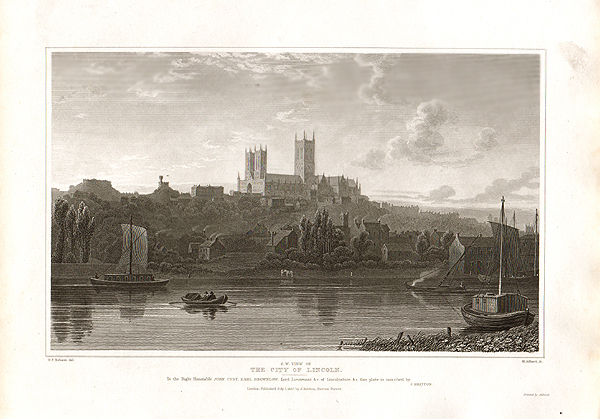 City of Lincoln, South East view. An antique line engraving by E. Finden after W. Westall. A.R.A. Published in 1828. Later coloured by hand. An antique line engraving by W. Watkins after R.G. Topham. Circa 1835. Later coloured by hand. The South West View of Lincoln Castle. An antique line engraving by F. Stevens after A. Pugin. Published in 1815. North view of Temple Bruer in the middle of the great heath on the South side of the City of Lincoln. South West view of Lincoln Castle. More Info An antique line engraving after Samuel and Nathaniel Buck. Printed in London by Newbery and Carnan, between 1765-1770 from A Description of England and Wales. Later coloured by hand. An antique line engraving after Samuel and Nathaniel Buck. Printed in London by Newbery and Carnan, between 1765-1770 from A Description of England and Wales. Later coloured by hand. The South West view of Lincoln. An antique line engraving by J. Ryland. Circa 1800. The colouring is later. Agricultural Meeting at Lincoln : Messrs. Clayton and Shuttleworth's Works and the Show Yard. An antique woodcut engraving which was published in "The Illustrated London News" 7th August, 1869. An antique woodcut engraving entitled "Meeting of the Royal Agricultural Society at Lincoln" published in "The Illustrated London News" on July 22nd, 1854. View of the City of Lincoln from the South. An antique line engraving by J. Redway after W.H. Bartlett and T. M. Baynes. Published for "Britton's Picturesque Antiquities of English Cities" in 1829.